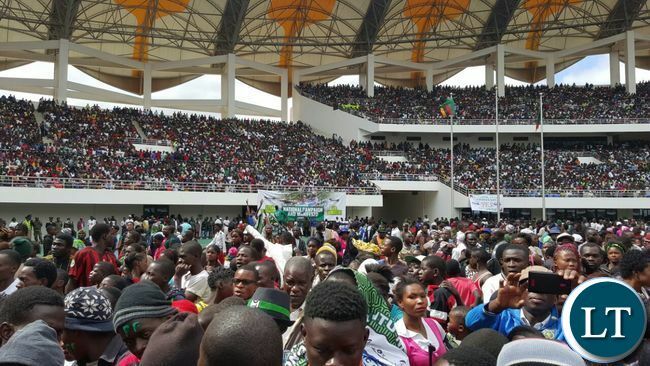 The ruling Patriotic Front launched its manifesto and a new Chitenge material to a record crowd of an estimated 120,000, believed to be Zambia’s first true mega rally. The new National Heroes Stadium with capacity of 60,000 was filled quickly by its supporters around 11 Hours and overflowed with all the stands, pitch and outside full rising to an estimated crowd of 120,000. The event was spiced with performances by some of the country’s leading musicians. 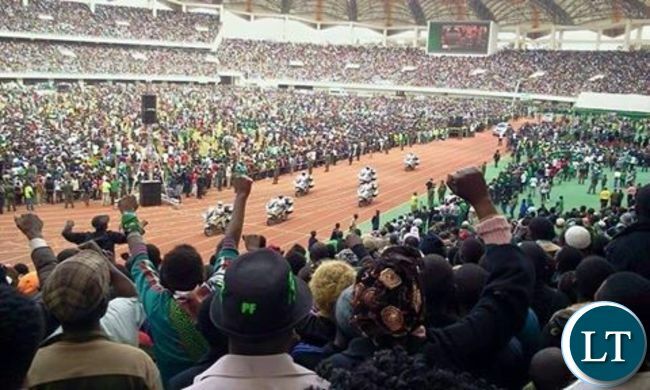 By the time President Edgar Lungu was arriving at 14:30 Hours, the PF supporters who filled the stadium beyond its designed capacity went into a welcoming frenzy and cheers. 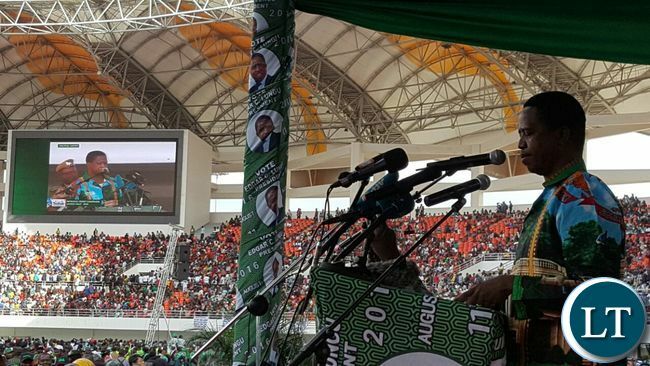 In his speech, President Lungu promised to build on the infrastructure development program by creating jobs and food security in his next 5 years if re-elected into office. 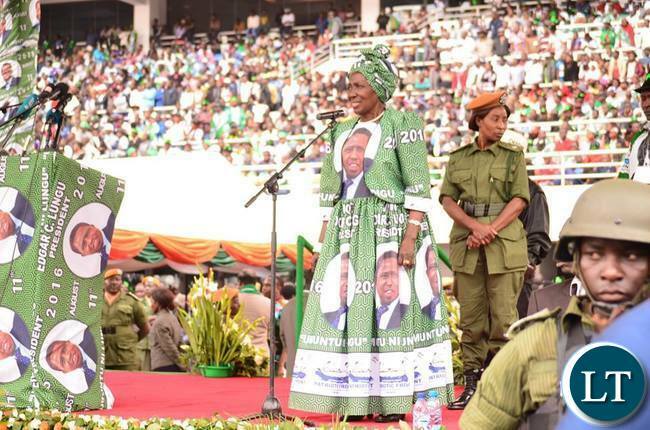 And President Lungu used to occasion to announce that Vice President Inonge Wina will be his running mate. And Mrs Wina thanked President Lungu for making her running mate in the 11th August election. She has told president Lungu that she is shocked with the appointment but that she is happy that she has chosen as running mate. In response, President Lungu told Mrs Wina that there was no need to substitute when a player is scoring goals. He has told her to work very hard to win the election. President Lungu and his running mate Veep President Inonge Wina at State house. Fourth President Rupiah Banda and former Veep Enock Kavindele at the PF campaign launch. She handed him the leadership by lying to Guy Scott. She is past her sell by date. She is offers nothing at all, honestly this will hurt In the long run. Even Mumbi Phiri as distasteful as she is , has some personality than this Wina. Sorry i just don’t know what she offers at all. @Katondo well said..numbers don’t lie!!! We said it some time back that the stadium would be packed! Come August we are getting it in Style!!!! Now let the UPND etc naysayers come with their negativity us we say no! God is with us and ba Lsk Times stop blocking posts from PF bloggers PLEASE BE FAIR! It is not only numbers, his message was also rich in content. Workable programs designed to improve lives of people if he can be given necessary support. I listened to UPND message too but it sounded hollow to me. HH’s message lacked the methodology! That is as much support as they will get, I doubt the number, but the rest of the 6 million voters have had enough of this mediocrity! God is great. It is a done deal deal for HH. Inonge Wins is a walkover. She has no constituency and can’t even win as MP in her previous constituency. You can’t get power from a bemba and ignore them. Bemba’s now are moving enmass to UPND where they will have a Bemba Veep at least. moreover western province is UPND second bedroom. Plus Lozi’s can’t support a PF government that has been dribbling them since 2011. Thank you God for this mistake. Mutati would have delivered more than Inonge. Bravo!! This was and is called a people’s own campaign launch. Now IT’S FIRE MULILO FIRE. Lungu is the man! Wina azalila! Just look at how hungry and hopeless the people are in the last picture. I can guarantee you that 75% of the people in this crowd have no sustainable jobs or cannot even afford three meals a day but yet the go support someone who increases his salary three times within a year, charters a plane for $300,000 when they are suffering. I always wonder why some Zambians will never learn a lesson. I am suspecting that these people went for the music rather than Lungu. INONGE WINA IS UST THE RIGHT CANDIDATE FOR RUNNING-MATE. SHE IS FULLY PATRIOTIC, LOYAL, HARD-WORKING, EQUALLY HUMBLE, AND SHE HAS DEEP KNOWLEDGE AND UNDERSTANDING OF NOT ONLY POLITICAL ISSUES BUT ALSO ECONOMIC AND INDUSTRIAL ISSUES. SHE IS A VERY LISTENING AND UNDERSTANDING LADY. SHE FULLY DESERVES THIS GESTURE FROM ECL. AND AS YOU HAVE PUT IT- IT’S A “DONE DEAL”. I FULLY SUPPORT HER. When engineers design anything they always put in a FACTOR OF SAFETY. This is why the stadium was able to withstand the crowd of over 100,000 although it was designed for 60,000. In earth quake prone areas there is factor to take care of seismic forces. Long live the engineering profession. Indeed, a “Done deal”, a congregation of Thieves & Beggars i.e. RB & Kavindele respectively!! Mother of all liars & Liar of all mothers has finally out done the little girls such as Siliti & Mumbi Fibili!! Trying to win over western Province – wena!! CHAGWA MUST FALL! LUNGU MUST FALL! CORRUPTION IS TOO MUCH IN PF GOVERNMENT. EMBEZZLING OF PUBLIC FUNDS IS TOO MUCH IN LUNGU’S GOVERNMENT. WE PROMISE TO KICK LUNGU OUT OF POWER THIS AUGUST. VIVA HH VIVA! I wonder why we are so obsessed with rally crowds. It’s never too late you can also be part of the ‘crowd’ I mean the winning Heroes Stadium crowd and not the losing kitwe rally crowd…. Meanwhile, Honourable Madam Inonge Wina, mother of the nation has been named Presidential Running Mate for the PF as Kaponya (HH) fails to verify GBM’s grade 12 status. GBM grade 6 drop out has given UPND Kasama Central to his qualified daughter Sibongile. Canicius Banda has been dribbled and flown out to South Africa on holiday, leaving UPND shenanigans to the blood thirsty scavengers, Hungry Hyenas and vultures. Nkombo has been ousted like a rat. Miles Sata, Mulenga Sampa and Maureen Mwana Wansala and Scott Mmembe are still destabilising UPND. Meanwhile Kaponya (HH) tries to polish his Satamic image with 500 crooked Bishops. But meanwhile 2021, Western Province shall lead the Zambian Presidency. Kudos! Sonta po! Sonta po! The PF rally was the hit of the year and Kaponya (HH) busy proclaiming “HH will fix it” what a loser this village Kaponya. What can you fix? Start by repaying the corruptly obtained Privatization monies. UPND is united and more are coming to join us, no more mediocre governments in 2016 and beyond! As for you num skull calling yourself kudos, enjoy what little time you have left benefiting from corruption; come September this year your and your cronies will be gone! @ Kudos, you indeed such a cadre, whatever you benefit from PF. Instead of utilizing your only 24 hours in a day, you live on blogging..Please!!! !..And you sound so helpless without PF…get a life man, even if you one of those people with zero skills.. Kudos, don t be fooled by the crowd, many came for ichimpwena, and many were ferried from different towns; Now look what has happened with the Marcopolo bus. How many have died just for Chama to prove a point????? Well done Mr Presido. This is a perfect choice. I know if you had picked a different person, UPND, as usual, were going to make political mileage. Viva ECL, Viva PF. Let the oppo see what oneness can achieve. politics is about numbers,no wonder upnd also celebrates those defections with no following. I know it’s about numbers but I think politicians (whether UPND, FDD, PF, MMD) put so much stress on themselves trying to fill up the rallies with people. Sometimes I feel rallies are meaningless because the people who attend have already made up their minds on who to vote for. Good choice your excellence!!! We are right behind you. Well said my brother, my Aunty Lady majestic Inonge is a queen. With that said Viva President Nawakwi. I am disappointed the PF have not stated their plans/vision. LT has a big headline but no substance in the story, what is it that people should expect in the next 5 years. Are the people going to eat infrastructure. President Lungu should take advantage of such occasions to address issues that will improve the economy and their lives. Not impressive,with all those buses from all the 10 provinces ,I can see some empty seats ya orange,so which full full capacity , just because open wings were filled up doesn’t translate to full stadium capacity . Good pick on running mate though . I like Bo wina though she doesn’t add value,Rb is a man with no direction . HH also stated at his rally in Kitwe that the gathering at his launch was drawn from all parts of the country unless you didn’t watch his launch! You guys have been busy blogging on online media. The country side is saying sonta apowabomba. my translation as as a bemba is that “people are saying we c an not remove a working president” ECL has achieved what others failed to achieve in 27 years, 10 years, 7 years, 1 1/2 3 years”. ECL is an achiever whether you like it or not. ECL State Councel for president 2016. The man practically feeds you, owns 2/3 of Lusaka is the one you are asking ati Sonta apo wa bomba? Let’s start with you. How many generations from you will have to save red cents and starve to accumulate a quarter of what he has? For Zambia to develop we need people who can think, not just throw about empty slogans. Democracy is in the numbers. PF has the numbers plus state machinery. Sorry but this is just the fact. Go hung if you don’t like it. I just verified my voters’ credentials. Where is the PF Manifesto? If they win what are they going to do for the next 5 yrs? Does ECL and Pf have a vision? People don’t eat infrastructure so what is PF’s plans on bread and butter issues? David, sorry that the numbers at the P F rally have confused you. 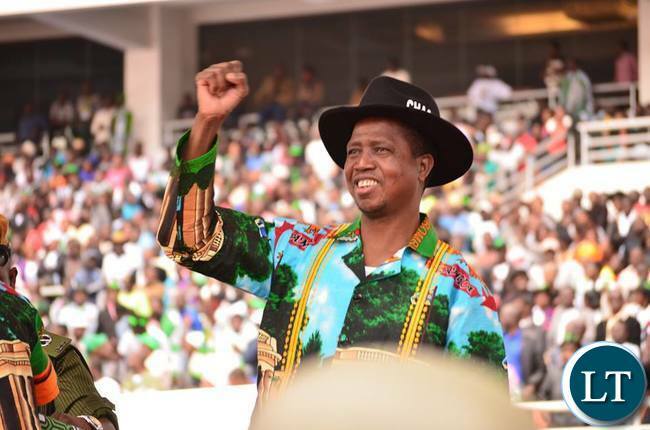 The Party President, Edgar Changwa Lungu, clearly out lined what the P F will do in the next five year once the people give them another mandate. The P F have proved that they can work, and surely lets us give E C L his five year term in office. Please learn to be objective. If you are a lazy BAAM, them you can’t see the use of infrastucture, because you have a small brain. OPPOSITION MUKOSE. THE FRENZY AND EUPHORIA AT THE RALLY JUST PROVE PEOPLE AND VOTING PF BACK IN OFFICE ON 11TH. Is the selection of Inonge Wina as a Running mate PF’s Manifesto? Do they even know what an election Manifesto is? So Zambian can vote for PF for unexplained roads and food security? No plan. No vision? If UPND called a rally at same stadium today, even without free publicity by ZNBC and use of state resources and musicians, it can fill the stadium. That is Lusaka, the capital city by the way. In short, the attendance is no reason for celebration. MMD danced with confidence after the mother of all rallies; so meticulously arranged in Mandevu, only to lose. Worse still, EL cannot address crowds and that was a huge anticlimax…it showed immediately what people came for! Stands were empty by the time the president was speaking. DeadNBC even stopped showing the stands so I don’t what you are celebrating for. You were in the stands AND watching TV which stopped showing the stands..! Honestly speaking, picking Inonge Wina might seem to be a good move but this is a very big mistake by Lungu because Mrs Wina has passed her sale by date. The woman is 75 years and by the time the 5 year term ends if at all the PF wins she will be completely finished. She is supposed to retire after this elections. She is a stumbling to would be young vibrant women aspiring to be politicians. Anyway it is wishful thinking that she would e one day the president of Zambia. How old is Barney Sanders who is challenging Hillary Clinton? He is 74 years old . How old is Hillary Clinton? She is 69 years old. Are American voters saying anything about the ages of their candidates? Definitely no. So, if you don’t know your facts, keep quiet and go and have cold beer at some nondescript bar in Mutendere. @20 ONLY IN YOUR EYES HAS INONGE WINA, “passed her sale by date”. TO ME AND OTHER WELL MEANING ZAMBIANS WHO ARE IN THE MAJORITY, INONGE WINA HAS A LOT AND MANY MORE YEARS TO EFFECTIVELY CONTRIBUTE TO ECONOMIC GROWTH OF ZAMBIA AND THE POLITICAL MATURITY OF OUR BELOVED COUNTRY. I LOVE HER, MY PEOPLE LOVE HER AND ZAMBIA LOVES HER. VIVA INONGE, VIVA ECL, VIVA PF AND VIVA ZAMBIANS. MY APPEAL TO ALL ZAMBIANS IS, DON’T WASTE YOUR VOTES ON CHITOMBWA. INVEST YOUR VOTE ON ECL. You bet Mumbi-Njovu, Luo and the whole Bembanic Janjaweeds are fuming because they wanted a Kasai as Lungu’s running mate. Anyway, those lousy Lozi chaos are voting for HH anyway, he is the logical candidate. I we stop being an I.diot How can a Kasai be a running mate as if we are in Congo? If you mean those who trace their migration from Congo then you needs to read your history rather than expose your ignorance. Ba LT, did you count the people at the stadium in excess of the stadium capacity? 120,000 estimated attendance is not a reason to feel euphoric. For God’s sake, those people came from all over the country! Lusaka population is pushing towards 3 million.Let us suppose the attendance was 120,000. That means Lusaka contributed 90,000. Where were the other 2.5m plus people? The popularity yardstick used by PF is therefore flawed. Representative sampling (n), you can not ‘sample’ the whole population (N)…! …and you should have at least said “where were the other 2.9 m plus people..”. Your math is puzzling! So ba LT, there was only one rally today or you did not send your reporters to Kitwe? To you all who support tribal HH,you must seat down and think after what we all saw at heroes stadium! !NO RALLY HAS BEEN ATTENDED BY SUCH MAGNITUDES OF PEOPLE IN ZAMBIAN HISTORY! !WE WERE THERE AND SAW IT WITH OUR OWN NAKED EYES! !PEOPLE WHO FAILED TO GO TO HEROES STADIUM,STOOD ALONG GREAT NORTH ROAD AND SHOUTED “PABWATO PABWATO”! !LUSAKA CAME TO STANDSTILL TODAY! !upnd must for once stop claiming that they have taken up popularity in Lusaka or even Copperbelt BECAUSE PF IS EVEN MORE LOVED NIW THAN BEFORE!! !HH WILL BE 100% DEFEATED BY EDGAR LUNGU ON 11/08/2016!! !today people like guy scott,mulenga sata,miles sampa,gbm have felt very f00lish because they move to kill pf has backfired BECAUSE MAJORITY VOTERS ARE VERY MUCH IN LOVE WITH PF!!! Bemba’s dribbled again by Edgar. I wonder what Mutati, Harry Kalaba etc are now thinking. He made Mutati run around and hijacking Nevers Mumba’s presidency only to be told on the very day of overthrowing Nevers Mumba that too late, madam Inonge is already on the throne. I wonder where Dora, Luo, etc are now. They’ve been hit unbelievably. Any way for UPND its a day of celebration. But knowing Edgar, tomorrow he can change and name another running mate. How does Mutati figure, Edgar already announced that he would pick a woman, unless of course Mutati is..!? So when Lungu said his running mate would be a woman you thought he meant Mutati or Kalaba.kkkkkkk. Surely you didn’t think he meant Mumbi or Luo either! As for dribbling, we have not voted for him yet so tekanya sana. 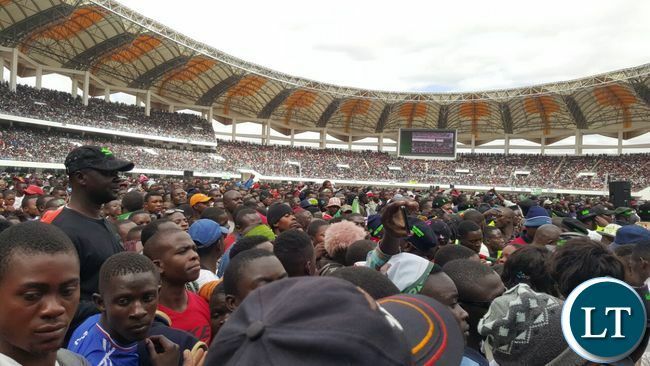 120,000 my foot.Lusaka stadium only has a capacity of 60,000 and there were plenty empty seats behind the podium.Those gathered on the pitch can not even number 10,000.It is not surprising that many shots were taken from the podium and not among the crowd. Ati Mega rally.When the final result is announced in August,UTH will not cope with patients coming with BP and heart related cases. Half full or half empty….stop being a naysayer…FYI come August 11…HH will be history…PF is winning…did I say PF is winning? Ok let me put it this way. ..PF has already won the elections…did you hear what I just said? @INDEPENDENT:Unless you a lunatic and you cannot see! !am sure as usual you are an upnd cadre who lives abroad.WE WERE AT HEROES STADIUM AND IT WAS FULL AS EARLY AS 11HRS.EVEN YOUR UPND SITE ZWD HAS REPORTED THAT PF CADRES FILL UP HEROES STADIUM FAR BEYOND ITS CAPACITY!ZWD WENT FURTHER ADMITING THAT SINCE 2008,LUSAKA HAS BEEN PF’S STRONGHOLD HENCE FILLING UP THE STADIUM TODAY! !LUSAKA CAME TO STANDSTILL DUE TO HISTORICAL PF RALLY AT HEROES! !upnd must forget about defeating pf in 2016 or winning any seat in Lusaka or Copperbelt urban because those seats will be retained by mighty pf! !”UMUNTU NI LUNGU-2016!! The people you saw today at the stadium are people from all over Zambia- village Kalasa Mukoso in Mansa were there, village Chimbwi in Petauke were there, village Mboole in Choma were there and not forgeting Kampumbu village in Isoka were all there with free transport and beer where as HH had only Copperbelt. In fact it won’t be long before we hear that cadres are complaining of non payment of money promised for attending this rally. PF are excited after taking cadres from all corners of the country to Lusaka. How can Chagwa win elections with his pathetic performance in his 12 months in office? All the industries would close and bank interest rates would be over 100% if by an unfortunate miracle Chagwa found his way back to statehouse after 11th August. 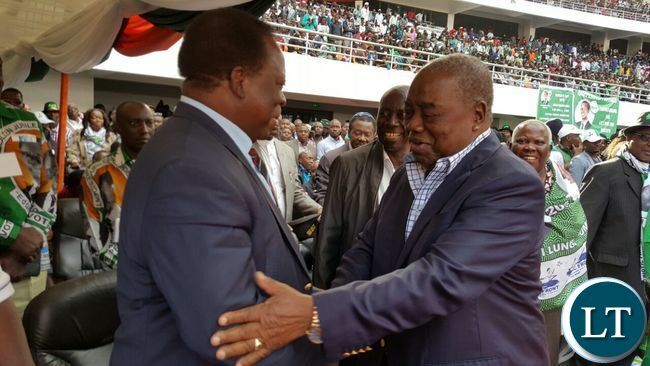 It looks like UPND supporters have already conceded defeat….don’t give up hope just as yet my friend…..it is what it is…PF is winning..no doubt about that and you can be part of the winning team too it’d never too late..
Katondo Boys, these people are in denial. We were there, we saw it with our own eyes. Umuntu ni Lungu mwebena Zambia. Umuntu ,pabantu ni Mwana wa mu LUNGU.Viva ECL. THE FACT THAT THE STADIUM WAS FULL BY TEN HOURS SHOULD TELL YOU A STORY. IT WAS FILLED BY PEOPLE WHO CAME FROM AFAR AND ARRIVED IN THE NIGHT AND EARLY MORNING. OTHERS WENT FOR FREE ENTERTAINMENT. IN MY VIEW PF ARE FOOLING THEMSELVES. IN KITWE PEOPLE WALKED LONG DISTANCES TO ATTEND THE RALLY NOT FOR ENTERTAINMENT. IT’S EASY TO FEEL UP THE STADIUM GIVEN ITS LOCATION WHICH IS NOT THE CASE WITH FREEDOM PARK. UPND are the ones fooling themselves. Early in the morning on Saturday, I witnessed thousands of people walking to Heroes Stadium voluntarily from as far as Kalingalinga and Mutendere. If people came from outside Lusaka, should that surprise you? My foot! This was expected because this was a national inaugural rally to flag of the PF campaign! Even the UPND rally at Freedom Park was supposed to have the same national character, but it fell far short in size compared to the PF rally even though the UPND bused in supporters from all parts of the Copperbelt and beyond. By the way, can you tell us who HH’s running mate is? When people say a good number of bloggers are are outside Zambia, sometimes you may doubt it but with what transpired today at Heroes Stadium and at Freedom Park in Kitwe, I think they are right. How does somebody find it possible to argue with numbers physically seen? I thought this would be an opportunity for UPND to re-strategise in the remaining three months to gain as much numbers from Lusaka as possible. The best way to win in life is first to acknowledge the reality on the ground then take practical steps to address the challenge then one emerges a winner. But to say those multitudes came from other provinces is self denial. Ok UPND has work to do. Even their Kitwe rally did not reflect the assertions of that miners are angry with PF. Numbers don’t lie…..Heroes stadium vs Kitwe freedom park……and the winner is………. ICISHINKA FYE NKATEMWA ILYO LUNGU AKAKONKANYAPO. PF ALA PITENI MUKONKANYEPO LIMBI BAMO KUTI BACHINJAKO NOKULEKA UKUKANA TASHA. KANO NGA EBO ELO NACO CALIKANGA. Imwe abantu bacifula mwe. Mwati kuti wakana. UPND will come second in this election. @Katondo boys. The reality is people are suffering, hungry, jobless. You name it and it should be called as it is. After borrowing 2 billion USD. Can PF account for all that money? and how exactly it has improved people’s lives?? There is more crime today in Zambia than any other time our country’s history? There is more poverty today in Zambia than any other time in Zambia history? There is more jobless people in Zambia than any other time in Zambia history? There is more corruption today than any other time in Zambia history? There is more breach of rule of law in Zambia today than any other time in Zambia’s history? All in all, Zambia has become unstable in various ways: economic, social etc. What can Lungu claim he has done to change this? Big rally headlines but no substance, plan or vision for the next 5 years, why should people re-elect ECL, still waiting for answers that will help people make an informed decision. I am sick of this allusion to “infrastructure development” by Lungu. The prioritising is wrong – or at least it has to go hand in hand with development that has a human face and actually improves the quality of life (industry, sustainable agriculture policy that makes food a basic commodity not a luxury, reliable energy, water, sanitation, a health and social care pathway, sewerage systems, information technology that statistically informs planners of the demographics and social needs) In short, what’s the point of roads that do not transport local produce to local industry? Or dodgy buildings without medicine or proper health personnel? By the way, Kigali City (Rwanda) is 2016 city of the year. Cleanliness, but also progress in the human development index. Here’s the thing. During signing of the constitution the stadium was empty and pf was embarrsed. So this time they hired buses to collect cadres from all over the country to fill up stadium… The results of this.. One of the buses carrying cadres back to Ndola was in an accident and people died. Sincerely how desperate And selfish is this Ba pf? Using innocent people and now someone’s mother someone’s father has died. And for pipo like kudos .. Yes for now u can enjoy the cheap Tt u re given to blog but think of a future u want your children to grow in. UPND you have just been clobbered on this one you never expected it. PF has strong mobilisation on the ground while UPND has strong mobilisation on social media. Don’t think that it will be easy this time around because PF is more than ready to defend its strongholds. Lusaka is very much PF don’t cheat yourselves. Its unfortunate that those friend from Copperbelt were found in an accident. UPND you have no clear understanding of what alternatives you need to propose to move PF support base. PF has worked so please don’t think that by just saying Ubunga wadula then people will follow you. PF has solutions to the challenges and they are solving them you just know how to complain. Upwi n d is for educated people that’s why they are very popular online. It’s for those with degrees, MBAs, and Doctorates. You can do the math and get the percentage of those people from the Zambian population. Please add those in the diaspora too. Keep in mind that the majority of the elocatorate have a very basic or no formal education at all but they have voter’s cards just like the educated ones. Tragedy has fallen on cadres who were ferried from the Copperbelt.The bus they were in was involved in an accident and some passengers died.Why did they have to travel to Lusaka.Just like the UPND and parties ,the PF will have to campaign on the Copperbelt.Just stay in your respective town.You lose your life just because you attended a party rally.What a terrible loss. Cadre where ferried from all over the country and you say a record crowd. Others just went there to watch musicians. HH has a 10 point Plan. What vision or Plan does Lungu have? Will choosing Inonge Wina as a Running Mate strategic and will she add value to Lungu? Does Inonge Wina have strong support in Western Province? Inonge Wina is loyal but not charismatic and so of what use is she to Lungu? Am sure he’s always had that 10 point plan my friend but look where he always ends up. Ashalafye na 10 point plan mukanwa ne chisungu, chapwa. You are the same people letting him down because you can’t humble yourselves enough to engage the grassroots which are comprised of semi literate people. Akantu ni pa social media ukuimwenesha nefisungu iifyaishile na D. Livingstone. Thank you Moscow. Walanda bwino sana. These people don’t listen and they never learn. Anything Lungu does they observe using tribal rose coloured glasses. Not everything is about tribe. That same tribal card they are using is what will bring them down for the 5th time. Yes, we will vote on tribal lines again on the copperbelt because southern province has the same voting pattern. In eastern province, we are going for one umozdi kumawa, wako ni wako. No violence but nga mwatukonka, kumiponona. Mpaka litente. Umuntu ni Lungu. Nga tauli Lungu ninshi tapali efyo uli. Yes some people came from outside Lusaka but the majority of the people came from within Lusaka. Do your arithmetic. How many buses would have been required to bring in people from outside Lusaka for 100,000 people assuming only 20,000 people came from within Lusaka? You are the same people who said the stadium would never be filled. I can only imagine your celebrations had the stadium not been filled. Ba Senior, we were there. Most of these people came walking out of the compounds. Some were on public transport and when there was a traffic jam at some point, they jumped off the public transport and started walking. There were a few that were ferried because they belong to particular wards and those wards organised their own transport. But honestly just as you have said, how many vehicles could have ferried 100 thsnd plus cadres? The writing is on the wall. Ichintu chintu umwene. Umuntu ni Lungu chapwa. Kikikikikiki ba under 5, Hahaha ala 10 points by your idol god is not good, a part without a manifestio is can’t govern, politically impotent. I think 11 August will end in tears for those projecting a misguided model of popularity. The opposition has used violence and arrogance to project that they have gained popularity. What is miscalculated is that in Northern Province rural, PF is very popular. UPND has covered some insufficient ground in Kasama Central, but even their choice of MP shows that they will lose lamentably. Northern Province could go 35,000 votes for HH and 400,000 for Edgar Lungu. All I can say is that watch Eastern and Western Provinces closely. If Edgar Lungu scores 70+% in Eastern Province, you might as well stop counting ballots. Copperbelt will not vote HH, he will improve their, perhaps 90,000 to 450,000 and perhaps no MP (maybe Kafulafuta, Masaiti or Mpongwe). HH will receive a rude shock.I stay in chingola and majority are saying we give lunguva chance.most pipo here dont trust HH coz of mines privatisation.i can asure u no bus picked anyone here to go to lusaka.viva PF. Jumping around and dancing without a clear plan for mother Zambia is trying to dance away from important issues. Seriously, what is Edgar Lungu’s plan for Zambia? Why is it costing us Zambians 2 million dollars per kilometer of borrowed money to build our roads, while in South Africa its 400,000 dollars. Why is my future, and my children’s future being subjected to this extra cost, hence extra debt? These are the issues we should be debating. big rally, incident free. bushe ba upnd teti mukumbweko? HH loses again!!! GMB busy beating up his innocent Zambian he claims to have solutions for! There you are ba UPND … mukafwa na idea! Tamwakatekepo!!!! We said it ooooo Whats on ground is a completely different thing. Ba ECL we are coming to vote you back in power. Ifintu ni LUNGU . Lets see if Pastor’s prophecy doesnt come to pass. Kaponya (HH) does not like this. PF leadership spent more than US $2.3 million dollars taxpayers money to ferry people around the country in more than 1000 hired buses for the Saturday Heroes Stadium event where they were expected to launch their manifesto. Bills seen by the Zambian Watchdog indicate that close to US$ 500,000 was spent on paying musicians alone while delegates were also being paid some allowances for attending, and that is minus hotel bookings.PF is a party of deluded corrupt politicians it is now time flush out these idi-ots. 1. We vow not to go for HH until he explains what happened to the sale of our mines at such a cheap price. No matter how many times he stands, sorry baba. 2. HH hasn’t yet denounced his membership as a free mason, that satanic movement. Why? Baba, you are still a member and us Zambians know it. We shall not make such a mistake of putting you in state house. Am concerned about Zambians supporting tyranny, most of you don’t understand how bad governance affects the economy analyze before making a choice that will affect the future you.